Our innovative Linerless labels have some huge benefits. If you are a large user of integrated labels you could consider using our Linerless Label option. The print space on an operational despatch note is valuable and sometimes can be difficult to fit all the returns and marketing information on. By using our linerless labels forms, you can utilise the print area better by enabling you to ‘pre-print’ marketing/returns messages underneath the liner, appearing when the label is removed. 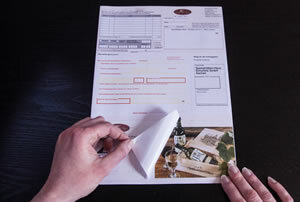 These forms are also much friendlier to the environment as the form is easier to recycle after use as has a much lower silicone content and by producing them in this method actually enabling the form to be recycled once the label has been removed. They are manufactured by applying a silicone patch to the base paper and then are die cut through the paper which in turn creates the label. A thin layer of silicone is then applied on to the paper and adhesive is then applied on to the silicone where the label paper layer is then introduced. For more information on ordering your own lintless labels, please contact us.